July marks the 25th anniversary of the passage of the Americans with Disabilities Act. The entire month has been declared Disability Pride Month in the U.S. A Disability Pride parade being organized for July 12 in New York by a coalition of disability rights groups has also been endorsed by several city agencies and elected officials. A Disability Pride event is also scheduled for Boston on July 22. How do disabled activists view this momentous anniversary and the perspective for the disabled liberation movement? WW canvassed a number of members of the Workers World Party People with Disabilities Caucus. Here are their views. “The right wing attacked this law even before it was passed. Outright bigots, such as Sen. Jesse Helms from North Carolina, tried to stop the momentum for passage of the ADA. They whipped up a frenzy and fear around people with AIDS, who are protected by the ADA. Helms and others tried to add to the ADA draconian restrictions on food service workers, concerns about sanitation or what illnesses could be contracted from food handlers that were unscientific. But activists organized to fight back — and stopped this. “The ADA represented significant gains. But it is important to remember that, like any other piece of legislation, it reflects the strength of the class struggle at that time. The right wing was able to whittle away some of the ADA’s important provisions, gutting much of Title 1 of the law, which prohibited discrimination in employment. “The ADA was won by fierce and protracted struggle by people with disabilities and their supporters. 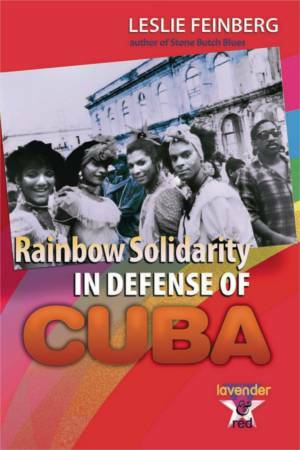 As with the Civil Rights Act of 1964, the struggle now is to protect its gains, get it fully implemented and expand its scope,” Shea concluded. Because of the pressure of the disability rights movement, on Sept. 25, 2008, amendments to the ADA were passed. They emphasize that the definition of disability should be construed in favor of broad coverage of individuals to the maximum extent permitted by the terms of the ADA and generally shall not require extensive analysis. Important changes were made to the definition of the term “disability,” rejecting several Supreme Court decisions and portions of the U.S. Equal Employment Opportunity Commission’s ADA regulations. These changes make it easier for an individual seeking protection under the ADA to establish that he or she has a disability. “What is disability? How is it seen? With derision, compassion, bewilderment. Disability is the inability to live freely without restraints, either physical or mental. “Many disabilities go unnoticed or are assumed to be something they are not, like deafness. I’m going to steer away from the traditional view of disability and include in my list other forms not generally recognized as inhibiting mind and body. They are homelessness, incarceration, obesity, old age and various conditions of chronic health problems. “Before the Americans with Disabilities Act was passed, there was no access for the disabled on public transport. ­Betsey Gimbel, a courageous WWP Disability Caucus leader and secretary of Disabled in Action, who used a wheelchair, took on the city of New York to change this. She was undaunted by resistance from the bureaucrats. After several years, wheelchair lifts and ramps were installed on city buses and elevators in some subway stations. 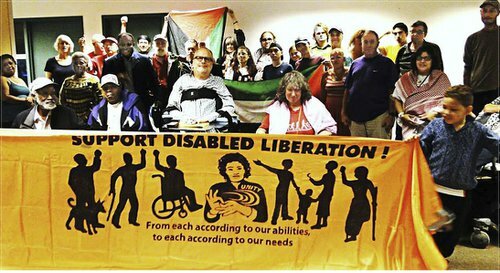 “Another fiery advocate for political change, who also uses a wheelchair, is Workers World Party founding member Rosie Neidenberg, who struggled and fought not for herself but for revolutionary change for others. In the 1950s she audaciously interrupted a red-baiting House Un-American Activities Committee hearing and today at the age of 94 still works faithfully every week on mailing out Workers World newspaper. Bill Bateman of Providence, R.I., diagnosed with bipolar depression, commented: “The ADA on paper was a huge victory for access to public places, public transportation and healthcare — physical and mental. However, like so many 20th century legal victories, many of its promises have become hollow and unkept due to lack of funding and unrelenting pressure from the ruling class and right wing to limit their scope and effect, and require a 21st century infusion of revolutionary energy from the masses. “Full civil rights for people with disabilities is not just the concern of the individuals with disabilities. It is also a concern of their families and especially of women. When people with disabilities are denied the equality of opportunity, economic self-determination, full participation in life and independent living as outlined in the ADA, it is usually a female family member who steps in to fill the need as best she can. Rene Imperato, a Vietnam veteran with several disabilities, including post-traumatic stress disorder, commented: “The safety of disabled people of color and disabled lesbian, gay, bisexual, transgender and queer people, especially those who use crutches and wheelchairs, is compromised by their skin color and their expression. All people have the right to self-defense by any means necessary. However, often disabled people have more limited options in how physically we can defend ourselves, especially disabled people of color and disabled LGBTQ people, who are the most ­targeted. Johnnie Stevens helped repair a school for disabled children in Puerta Esperanza, Cuba, while on a work brigade after hurricanes Gustavo and Ike. Stevens’ disability — dyslexia — made his videographic assignment, which required precise logging of seconds, minutes, hours, megabytes and terabytes, much more difficult and time-consuming. But the Cubans were patient. He completed the video and received an award. The great Civil Rights Movement of the 1950s and 1960s produced legislation like the Civil Rights Bill of 1964 and the Voting Rights Bill of 1965. Some of these “inalienable” rights of African Americans should have been made legally secure 100 years earlier, after the Civil War and the passage of the 13th, 14th and 15th Amendments. Today, a mass struggle aims at obliterating the racist Confederate flag. The ADA, a concession wrested from the 1%, must also be enforced and expanded with relentless, continued mass struggle, just as a union fights to enforce a contract won from the bosses through struggle. Edward Yudelovich, a WWP People with Disabilities Caucus organizer, has an emotional disability.